A Bandit’s Tale is a great book that opens a window to what it was like to live in the 1800’s. Rocco Zaccaro is an Italian immigrant who thinks that it is normal to be begging for pennies that are supposedly going to his family back in Italy. Then, he meets The Prince of Bandit’s Roost, who turns his life into one of riches, running, and sausages. If you like history and adventure, this is the book for you! Saving Mr. Terupt by Rob Buyea is the third book in a series I really love. This book shared another school year full of experiences of Buyea’s characters/Mr. Terupt’s students. Mr. Terupt’s fifth grade students: Peter, Anna, Jeffrey, Alexia, Danielle, Luke and Jessica, make posters, raise money, and try to save their favorite teacher’s job as their town suffers unexpected budget cuts. Which teachers should keep their jobs? Which teachers should go? Is there a way to do it fairly? I enjoy how the author breaks apart the story so that each character has their own opportunity to speak and share how they feel about a specific setting, event, or what’s going on at home. This is definitely a book I would recommend to people who like determination, adventure, and friendship changes. Can you imagine a teacher earning 4 million dollars? Can you imagine allowing your son or daughter to buy a pillow made for sleeping in class? How would you react to your son or daughter failing a class? As a teacher, how would you feel failing a student? How do you feel about the ones you have, intentionally or unintentionally, let fall behind? How do you adapt your teaching style so that every child succeeds and wants to succeed? Amanda Ripley’s book made me ask myself those questions and a plethora of others. Teachers have one of the most important jobs in the world. Students need good teachers and we, as adults, need to make sure children learn from the best every day. In this book, Amanda Ripley highlights the adventures of Kim, Eric, and Tom, three American teenagers, as they spend academic years abroad in Finland, South Korea, and Poland respectively. Through their stories, Ripley highlights the pros and the cons of the educational systems in those “smarter countries,” while comparing them with the pros and cons of our own system. She makes this comparison in a compelling way, so compelling to me that I, in turn, am challenging you to read her book and to make changes yourself. Listen, Slowly by award winning author Thanhha Lai is the story of a 12 year old Mia who is growing up in Laguna, California and looking forward to her summer at the beach with her friends. However, her parents inform her that she will be traveling with her grandmother to Vietnam to learn more about her family’s culture and find out what happened to her grandfather who went missing during the Vietnam War. Mia is very upset about this arrangement. Yet, during the course of the novel, Mia (Mai in Vietnam) learns a great deal about the Vietnamese culture as well as about her family, herself and life in general. I could not put this book down! The author’s voice made the characters both believable and intriguing. I would recommend this book to anyone who enjoys a wonderful story, especially if you liked Inside Out & Back Again by Thanhha Lai. Her books are enthralling. This is one of my new favorite books! I really liked this book. I would recommend this book to both boy and girls. The Story Thieves is about this boy named Owen who has always wanted to star in his own books. Owen hates the real world’s chores and homework. When he sees his classmate Bethany climbing out of a book in the library, he discovered that Bethany is half fictional and is looking for her fictional father who is lost in a book. Owen makes a deal. He will not say a word if Bethany takes him into his favorite series, the Kiel Gnomefoot series. It might help Bethany find her father or ruin the series. The Story Thieves is a fantasy book and a very good one. I could not put it down after the first page. I hope that you like this book. Happy reading! In preparation for this school year, Mrs. Abbott and I had a conversation about how many amazing things happened because of a seemingly small gesture: handing someone a book and telling them they have to read it. However, word-of-mouth recommendations are one of the most important factors in publishing. So we decided we wanted to see what books would capture the attention and imagination of Morse Pond’s book clubs this year. We don’t know what will happen, but here are the steps so far . . . I asked people from various publishing houses to make recommendations of what books they think could be “The Next Big Thing.” Kate (Random House), Bernie (HarperCollins), Debra (Candlewick), Barbara (Simon & Schuster), Eileen (Algonquin Young Readers), Lisa, (Little, Brown) all kindly sent a few contenders. I also picked up ARCs from Abrams, Macmillan, Scholastic, and Penguin at a recent conference (see the full list of books here). Mrs. Abbott and I talked about each book and let the kids decide which ones they want to read. We’ve explained to the kids that buzzing — both via word of mouth and in written reviews — is crucial to this project. 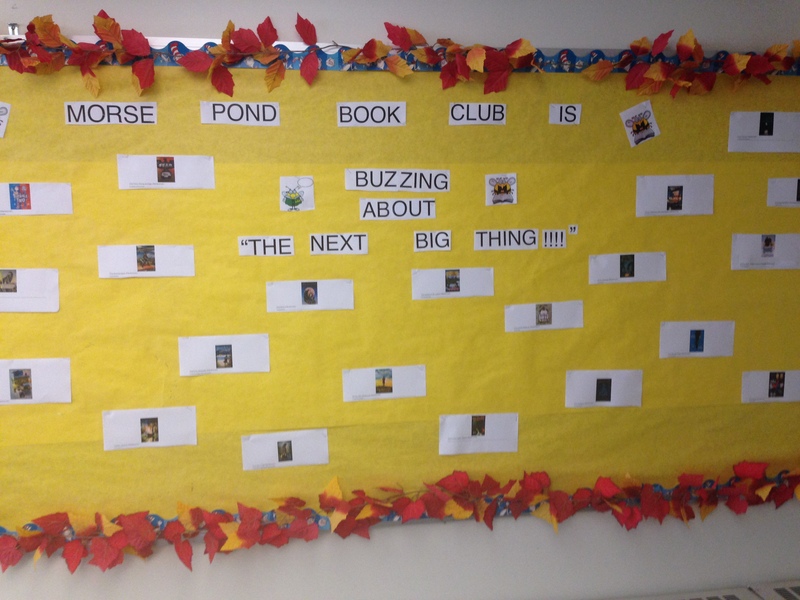 Mrs. Abbott put this awesome board up in the library and kids can post their comments about the books for their peers. Kids are talking to each other, their families, and teachers about some of their favorites. Mrs. Abbott can’t stop talking about Listen, Slowly by Thanhha Lai! Reviews are starting to arrive and will be posted here on the Eight Cousins blog — readers are, of course, free to read and review books not on the list. Although we don’t know what *will* happen, Mrs. Abbott and I already seeing a lot of middle school kids getting really excited about books, reading, and buzzing! Escape from Mr. Lemoncello’s Library is a favorite at Eight Cousins, Morse Pond, and the Falmouth Public Library. It was one of the Eight Cousins 2013 Picks of the Year, was one of Jill Erikson’s (Head Reference Librarian at the Falmouth Public Library) Summer Reading Picks, is currently listed on the Morse Pond Battle of the Books, and continues to get rave reviews from everyone who reads it. Carlos Ruiz Zafón’s final young adult novel is beautifully written and darkly captivating. Its onlydisappointing feature is the unfairly long time it took to be released in the US—it was originally published in Spanish in 1999. Oscar Drai, the lonely 15-year-old protagonist, wanders through parts of 1980 Barcelona that remain locked away ina frozen, post-war Spain. It’s in these anachronistic wanderings that he meets Marina, an equally lonely girl with whom he follows a mysterious woman from a graveyard to an abandoned greenhouse suffused with the stench of death. This act drags them into a web of all-too-real stories from the same era as their wanderings, and from which they are soon unable to disentangle themselves, as their investigations grow steadily more disturbing and dangerous. However, all the intrigue, suspense, and horror of their encounters with reanimated prosthetic limbs, faces ravaged by acid, and the ubiquitous black butterfly become simply a distractionfrom the devastatingly poignant ending. This novel defies categorization, seamlessly blending mystery, adventure, and suspense with a touch of the supernatural and a dash of romance. All of this is woven together in an incredible gothic story with achingly beautiful language and plot twists that keep the reader breathless and glued to the text until the final page. Warning: I gasped and shouted audibly in public while reading this book. It’s that good.